Anne McLane Kuster won election back to Congress in the 2012 elections, as a Democratic member from New Hampshire, representing the 2nd district. The Council for a Livable World, founded in 1962 by long-time socialist activist and alleged Soviet agent, Leo Szilard, is a non-profit advocacy organization that seeks to "reduce the danger of nuclear weapons and increase national security", primarily through supporting progressive, congressional candidates who support their policies. The Council supported Ann McLane Kuster (D-NH) in her 2010 Congressional election campaign. Kuster is a community activist who has spent years tirelessly advocating for public access to healthcare and higher education. She has also worked hard to promote peace and human rights, vocally opposing the Iraq war before it began. Ann McLane Kuster was supported by Council for a Livable World again in 2016. Annie got her first take in politics at 16 when she volunteered for the presidential campaign of Rep. Pete McKloskey, who ran on an anti-Vietnam war platform. Annie graduated from Dartmouth College in 1978 and from Georgetown University Law Center in 1984. Before her election to Congress in 2012, Annie served as an adoption lawyer, an advocate for public healthcare access and higher education, and a Democratic Party activist. Annie voted for the vitally important Iran nuclear agreement, a diplomatic triumph that holds great promise for the United States. She endorses reducing the U.S. nuclear weapons budget because the U.S. has more than enough nuclear weapons and supports the Kissinger-Schulz-Nunn-Perry vision of moving responsibly toward a world free of nuclear weapons. She would withdraw U.S. troops from Afghanistan as quickly as possible. In 2018 Ann McLane Kuster (D-NH-02) for House. Annie Kuster is a three-term House Member from New Hampshire who has thrived in the turbulent New Hampshire political scene that often tick-tocks between the two major parties. In this swing district, the NRCC is vowing to take the seat back. Lynne Blankenbeker, a U.S. Navy Captain and former state representative, is running against her, as well as two other candidates. Kuster got her first start in politics at 16 when she volunteered for the presidential campaign of Rep. Pete McKloskey (R), who ran on an anti-Vietnam war platform. She graduated from Dartmouth College in 1978 and from Georgetown University Law Center in 1984. Before her election to Congress in 2012, Kuster served as an adoption lawyer and an advocate for public healthcare access and higher education. CLW endorsed her in 2016, when she won a close contest. She is a strong supporter of the Iran nuclear agreement. 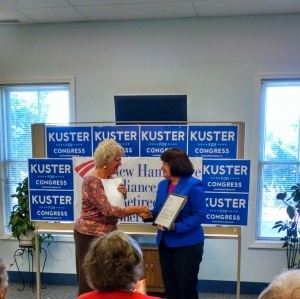 Kuster is currently supported by EMILY's List. In January 2013, Ann McLane Kuster was listed as a new member of the Congressional Progressive Caucus. In 2013 Progressive Democrats of America assigned activists to deliver their material to almost every US Congressman and several Senators. Chuck Townsend, was assigned as contact for Rep. Kuster. She is an outspoken advocate for the US-Israel relationship and two-state solution. Kuster’s 2016 race promises to be heavily targeted by outside groups. On August 22, 2012 in Concord, a group of New Hampshire Alliance for Retired Americans members and leaders gathered to give their endorsement to U.S. House candidate Ann McLane Kuster for New Hampshire's 2nd district. The Alliance for Retired Americans Political Action Fund endorsed Ann McLane Kuster in 2014. The Alliance for Retired Americans (ARA) announced its endorsement of Congresswoman Annie Kuster for reelection to the U.S. House of Representatives this November. The endorsement was made at the Senior Activity Center in Nashua, September 12, 2014. The Alliance for Retired Americans has endorsed Congresswoman Kuster because of her commitment to improving the lives of Granite State seniors. She has a clear record of standing up for seniors in the state, and she’s worked to protect Medicare and Social Security from harmful cuts. She also recently helped introduce the Social Security Caregiver Credit Act, which would help ease the financial burden on individuals who are serving as caregivers for their elderly relatives more than 80 hours per month. Congressional supporters by December 20 2018 included Ann McLane Kuster. This page was last modified on 28 December 2018, at 16:32.